In the summer of 1981, a young pediatrics resident viewed an X-ray that shook him to his very core – one of the first glimmers of HIV, the virus that causes AIDS, a disease that would kill many of his friends. “Though I would be spared the virus, this day would be split between the before and after in my life and I would be one of the survivors to tell the story of my people in the time of plague,” said Ken Haller, M.D., a SLUCare pediatrician at SSM Health Cardinal Glennon Children’s Hospital. 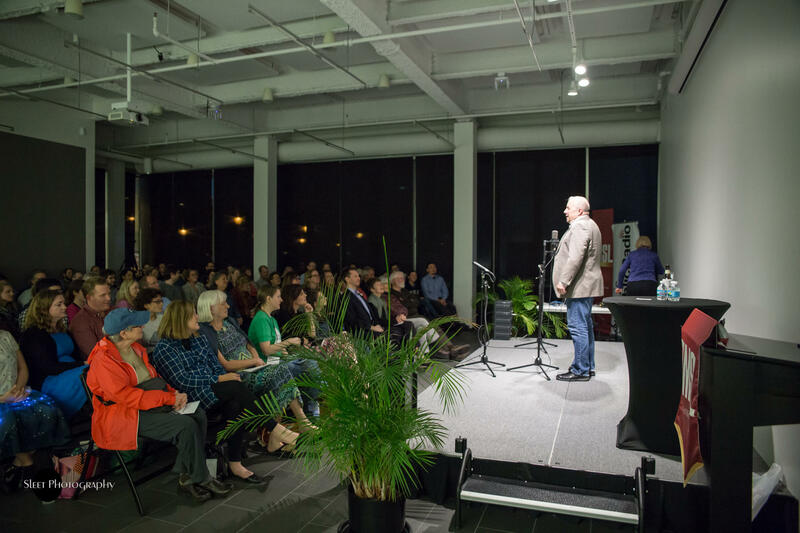 Haller was one of five storytellers chosen to share his deeply personal experience at Story Collider, a sciency version of the Moth Radio Hour that was presented by KWMU-FM 90.7 on May 2 and recently shared on St. Louis on the Air. He told the audience of 120 how it felt to be vulnerable as a gay man to a deadly disease that at the time didn’t yet have a name. “This is a story I had to tell. A long time ago, I decided that my personal mission in life came down to healing. In telling a story about something I went through that required healing, I felt that I could pass on some truths about how we can find a way to take something that’s really awful and make it a moment of grace for ourselves and those whose lives touch ours,” said Haller, who is a professor of pediatrics at Saint Louis University.